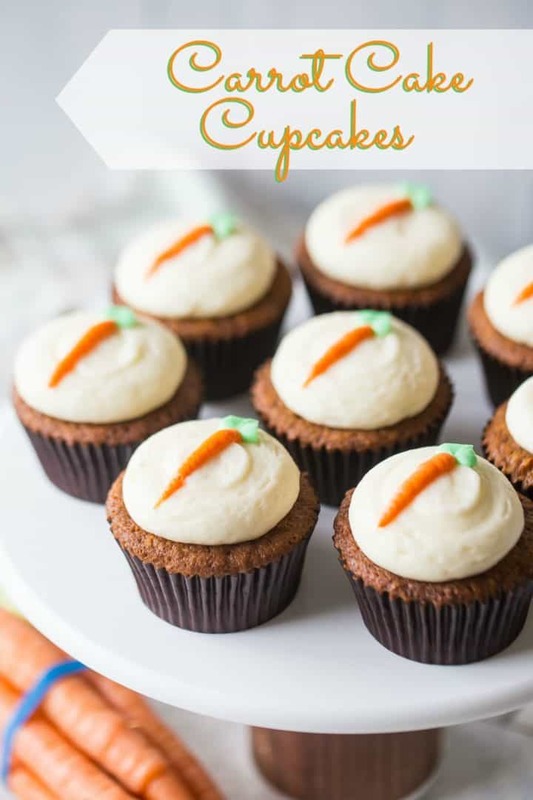 Carrot cake cupcakes: moist and easy to make, with brown sugar, pineapple, and warm cinnamon. Top them with cream cheese frosting for a truly classic treat! It’s a brand new week and I’m starting it off with a recipe that I truly love. Honest to goodness, I cannot get enough of this carrot cake! I created the recipe last year, as a carrot cake layer cake, and it was so good I thought it deserved a dedicated cupcake post too. I had to make a few minor tweaks to get that perfectly domed cupcake shape, but overall it has the exact same buttery richness, light texture, and full flavor. The sweet pineapple compliments the brown sugar in the most incredible way, and all the warm spice takes the flavors straight off the charts! 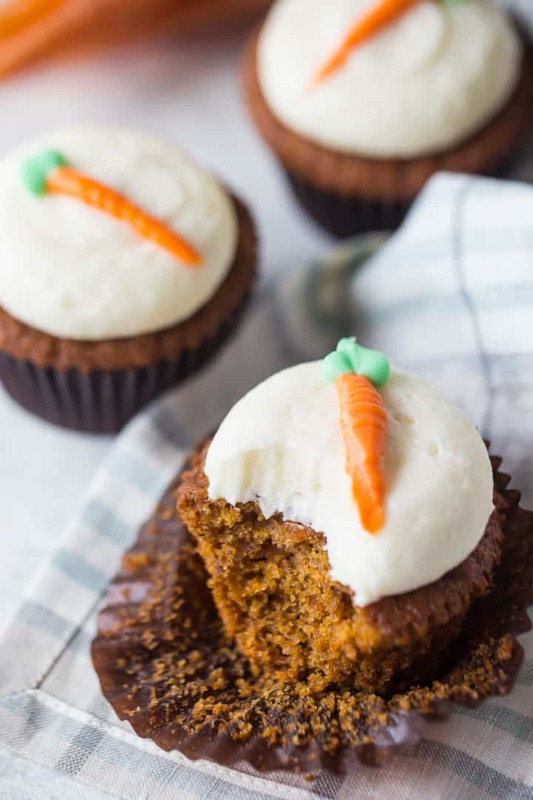 The thing that sets these carrot cake cupcakes apart is that it’s actually a pound cake recipe. I just love pound cake- it’s so velvety soft and buttery. Nothing can beat a slice of traditional pound cake, except for maybe lemon pound cake! Or marble pound cake! So while most carrot cake recipes are made with oil, this one is as buttery as can be. I love that! And it’s also really light and fluffy. So good! This recipe uses the traditional creaming method, which means you start by creaming the butter and sugar together until super light and fluffy! Use dark brown sugar and soft, room temperature unsalted butter for the best result. It will take anywhere from 5 to 8 FULL minutes to get the proper result. You’ll notice the mixture becomes very pale and doubles in volume. Once your butter/sugar reaches the proper consistency, add in the eggs, one at a time. Allow each egg to fully incorporate before adding in the next one, and be sure to scrape the bottom and sides of the bowl with a silicone spatula after each addition. Mix in the vanilla, and then the dry ingredients can go in. A combination of all-purpose and cake flour (all-purpose to make it sturdy; cake flour to make it light), baking powder and baking soda, salt, and spices. Mix these in until just barely combined, and then fold in the add-ins by hand. Scoop this batter into your cupcake pans, and bake away! 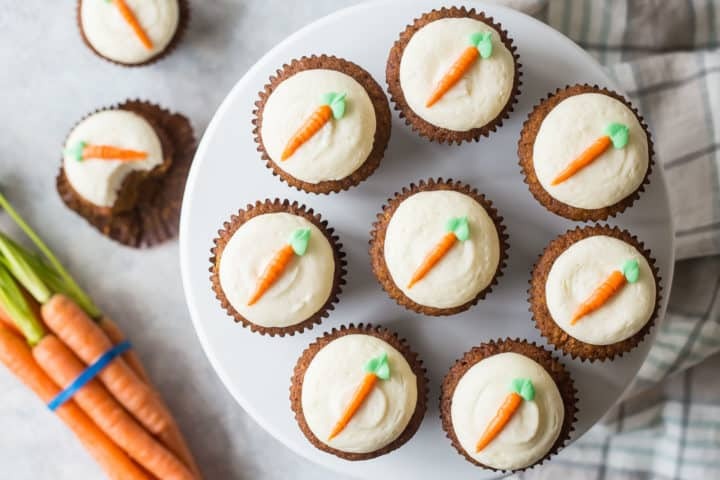 WHAT KIND OF ADD-INS CAN GO INTO CARROT CAKE CUPCAKES? And I would have really liked to have added golden raisins too, but my husband and kids won’t allow it. If you want to throw some in, I think about 1/2 cup would be perfect. Be sure to squeeze as much liquid as you can out of the pineapple! If you can get your hands on whole nutmeg, DO IT! The flavor is incredible. You can just grate it right into the bowl with a microplane. Here is a link to the food processor I use to grate carrots: Food Processor. It makes short work of it, and I really like to use the finer side of the grating disc. It gets the carrots just right! For the cupcake decoration you see here, I used a jumbo round tip to pipe a low, flat mound of cream cheese frosting. Then, just tint a little of that same frosting with orange icing color, and another small amount with leaf green. Use a #3 round tip to pipe the carrots, and a leaf tip to pipe the carrot tops. If you want to see what this looks like, just check out the video in the recipe card below. 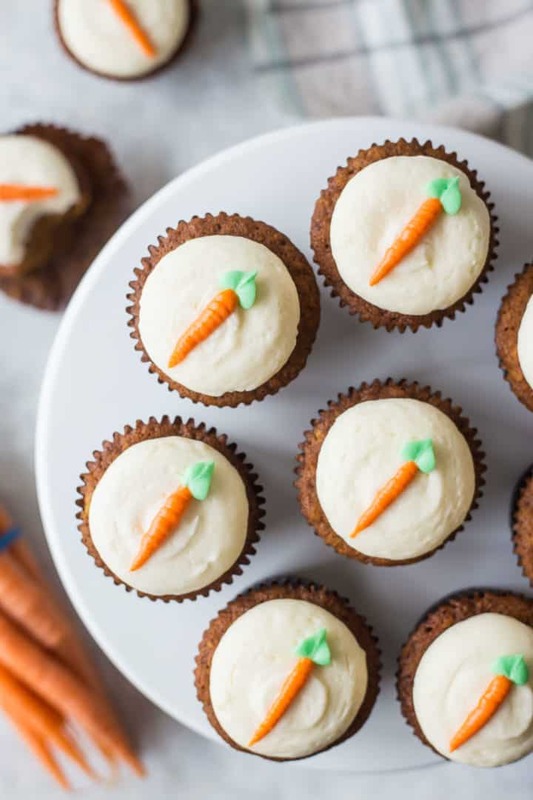 CAN CARROT CAKE CUPCAKES BE MADE AHEAD? You can definitely make these ahead! Bake them off and decorate them a few days before you plan to serve them, and it will take a lot of pressure off on the day of your party. These carrot cake cupcakes will last at room temperature (loosely covered) for a few days, or in the fridge for around a week. You can definitely freeze these cupcakes. I would recommend freezing them without the frosting (the freeze/thaw process tends to make cream cheese turn grainy). Just slip them into a zip top bag and place them in the freezer. They should keep there for around a month or two. Allow them to thaw at room temperature, and you’re good to go! 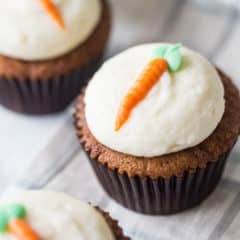 I think you will really love these carrot cake cupcakes! They are so light and buttery, and full of incredible flavor. The perfect way to welcome spring! Preheat the oven to 350 degrees F, and line a cupcake pan with papers. Place the butter and brown sugar in the bowl of an electric mixer, and whip on medium-high speed (scraping the bottom and sides of the bowl with a silicone spatula occasionally) until pale and very fluffy (5 to 8 minutes). Mix in the eggs, one at a time, stopping to scrape the bottom and sides of the bowl with a silicone spatula after each addition. Stir in the vanilla until well-blended. Stir in the flour, cinnamon, baking powder, baking soda, cloves, nutmeg, and salt on medium-low speed, until just barely combined (there should still be streaks of flour). Fold in the carrots, pineapple, and walnuts, and transfer the batter to the prepared pans. Bake for 28 to 32 minutes, or until a toothpick inserted in the thickest part of a cupcakes comes out clean. Cool completely, then top with cream cheese frosting. For the cake version of this recipe, click here: Carrot Cake. Where are the ingredients ? 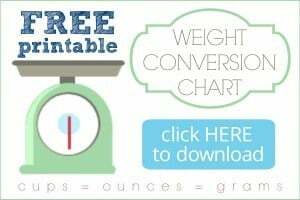 The recipe card can be found at the bottom of the post- all the ingredients are listed there, as well as their amounts and the recipe instructions.